VSCodium is VSCode without Microsoft Telemetry and branding. 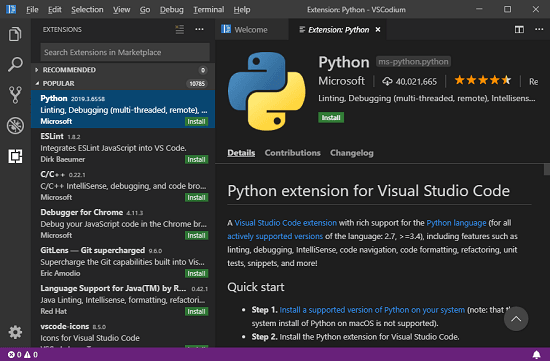 The legendary code editor, VSCode is open source by default but the executables that Microsoft provides are closed source as they contain a few extra things. Those few extra things that Microsoft adds are trackers to record user behavior in order to improve the product and there is Microsoft branding along with Microsoft’s license. But now, VSCodium has released which has open source binaries and there are no trackers in them. This is a complete replica of VSCode except Microsoft’s data recording features are not there. There is nothing else is different and you can use it in the same way you’ve been using VSCode. Although, you can compile VSCode from its source to get rid of trackers but that is a tedious tasks if you don’t have deep knowledge about Electron and Visual Studio. Which is why VSCodium has released. This is cross-platform and you just download its binary from its releases on GitHub and then start coding in any programming language you want. The VSCodium binaries are signed under MIT license and Telemetry is disabled. Free, Open Source, and Cross-platform: The open source binaries which are provided are free of charge and available for almost all platforms that most programmer use. If you are on Linux then you can install this on your PC via various package managers. Native Git Support: With native Git supports, you can quickly pouch changes to any branch of the code repository right from the editor. Push, diffs, pull from any hosted service right from the editor. Native Support for a lot of Languages: It supports all the popular programming languages like Node.js, Python, R, C, C++, Java, and many others.. You just write code and debug that. Plugin Support: Just like you install and use different plugins or extensions in VSCode, you can use them here as well. Just search any extension in the marketplace and then install it in a couple of clicks. Intellisense: In the open source binaries the Intellisense hasn’t lost. Since, Intellisense is mother of all code prediction tools and you will get it here in VSCodium. And with further extensions, you can even improve it. You can use whatever platforms you are using to run this VSCode replica. Since, I am on Windows 10 so I will be using it on Windows 10. This epic code editor comes as a portable as well as installer version. You just download it using the link at the end of this post and start using it. The interface is clean and the original logo is missing since Microsoft branding is also absent. In the main editor, you can start coding in your favorite programming language and debug your code. All the menus are same and you can install some external debugging plugins assist your works. The same command palette can easily be activated using the default keyboard shortcuts. There are various commands in the command palette section that you can use to execute some simple modules. You can take advantage of vast variety of extension from the marketplace and without being tracked. You can just open the marketplace and search any extension that you’d like to install. There are other things that you can configure such as Git and use that to quickly push changes to a remote repository. That is all about VSCodium. You just get it for your platform and start using it in the same way as you used to work on VSCode. Also, this is a good option if you don’t want to spend time in manually building VSCode from source in order to do the heavy lifting by yourself. 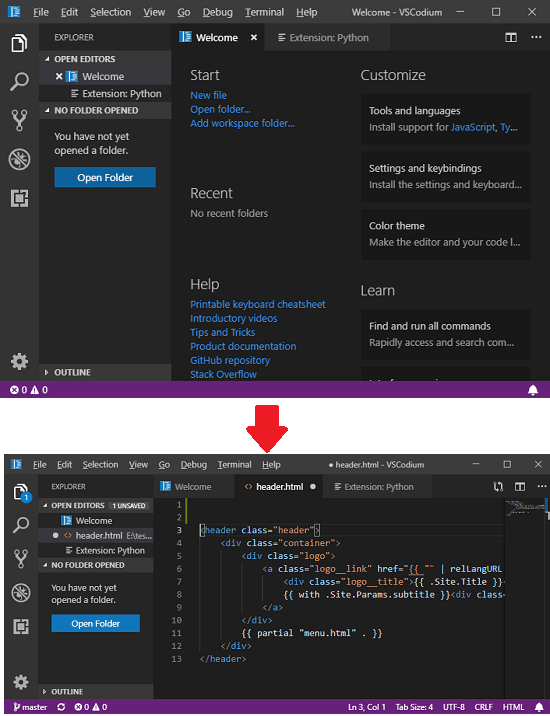 If you want to get away with the telemetry that Microsoft adds in VSCode for some reasons then you can simply switch to VSCodium. 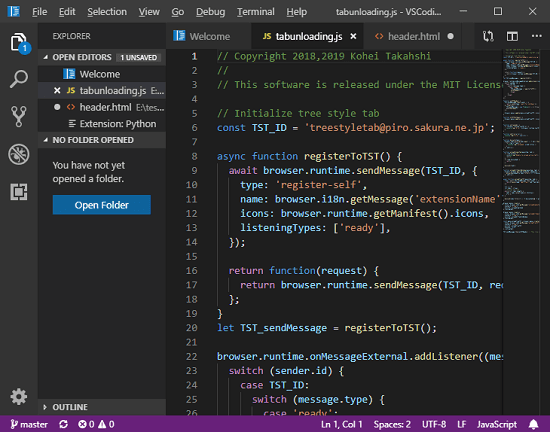 Personally, I don’t see any harm using the traditional VSCode but if you don’t want to share anything with MS then VSCodium is just for you. All the features of VSCode are there and you can use it in the same way.